As Carly was finishing up the final draft of Devil Music and starting to look for a professional editor, we started brainstorming what to do with it. The characters have some good chemistry to them which lends itself towards some comedy, and Carly had at one point considered trying to do the entirety of Devil Music as a graphic novel. So we settled onto the idea of a web comic to bridge the narrative gap between the end of the Devil Music book and the beginning of its sequel. We looked to try out a few potential candidates in order to find a good match for Carly. To this end, we decided to hire a few different artist candidates to each work with Carly to create a double character portrait of Cain Pseudomantis, the main character in Devil Music, in both his "human" form and his "demon" form. Carly posted to both the deviantART job offers forum and The Web Comic List dogpile, directly on Carly's blog on Blogger as well as reaching out directly to Woody Hearn of GU Comics (Carly liked his art style). It's about a half-demon named Cain Pseudomantis who becomes a hair-metal rocker in 1980's Los Angeles along with his three super-powered human friends. It's pulse-pounding, hair-raising, a whole slew of similar book reviewer's favorite catchphrases, and...you can't read it yet. I'm still searching for a publisher. I'm also hoping to create a supplemental web comic to chronicle the further antics and drama of the band. I'm in the process of writing up the first batch of comic strip material. Of course, web comics aren't just text; I'll need to throw a few pictures in there too. They won't be my pictures. I can't draw. That is why I'm looking to hire a part-time web comic artist on contract for the first year. I would like to have one (1) web comic created and posted per week. I am looking for a cell-shaded, moderately realistic style. Think along the lines of GU Comics, Ctrl+Alt+Del, or Questionable Content. I'll update this post when my search is complete. In addition to Woody Hearn, Carly worked with Hannah Nott, Ben Kariuki, and Candace Ellis. Each produced a double portrait of Cain with their own, unique touch. It was fun to look at all the possibilities. 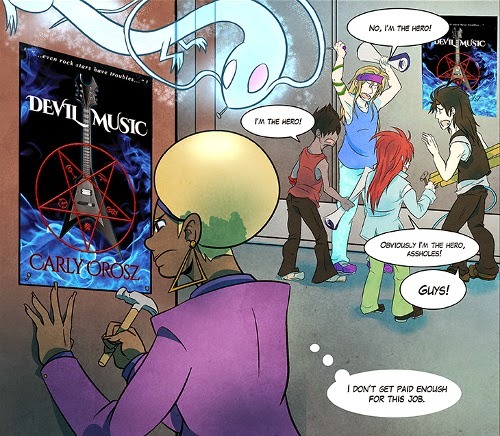 Ultimately, after significant consideration, Carly felt that Candace's communication style and personality meshed best with hers, and Carly felt Candace's art style was closest to what Carly had in mind for the Devil Music web comic. And that is why we have Candace Ellis to thank for a new Devil Music comic every Thursday, with the WiP going up on the Devil Music Series tumblr every Tuesday.